Apple’s media event, during which the company is expected to unveil the iPad 3, is only a few days away but some people just can’t wait to add to the feverish speculation of what the device will look like. 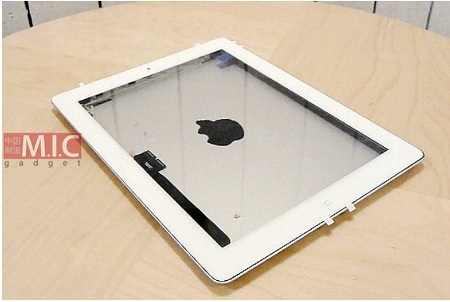 Related Story | Will retina display shortage impact iPad 3 supply? In the video, you’ll notice the bloggers didn’t actually put together a working tablet but merely assembled the outer shell of what they say will be the iPad 3. Even so, they came to a few conclusions. There will be a physical home button. Much speculation to the contrary has been flying around since Apple sent its invitation to the media. The invitation showed a small section of an iPad with no home button on the bezel, but it could be that Apple included a weird angle in the invitation to mess with rumormongers. PCWorld’s Jared Newman has already said he bets the home button is sticking around. He may very well be right — at least it appears so if the components M.I.C. Gadget used are legit. LTE connectivity will not be on board. Last week 9to5Mac reported that a reliable source said iPad 3 pricing would be the same as iPad 2 and that the next-gen configurations would remain at 16/32/64GB. Interestingly, 9to5Mac also said its report had no bearing on LTE. Even so, M.I.C. believes LTE won’t be on board the iPad 3 for two reasons: There’s currently a limited market for LTE and including the chip set would add an extra cost to each unit. iPad 2 covers are tight on the iPad 3. M.I.C played around with a few new iPad 3 cases and said thousands of them have been sent to the U.S. That’s hardly a revelation, although they did say people who want to use their iPad 2 cases on the iPad 3 will find it a tight fit because of the iPad 3’s tapered edges which may make it feel thinner even though the iPad 3 looks to be thicker than the current model. “Frankenslate” rumors aside, the leading theory is that the iPad 3 will sport an amazing Retina display, doubling the resolution over the previous models. Many Apple watchers believe the new tablet should get an updated camera and either a quad-core A6 processor or a dual-core A5X.